We invite you, your family and friends to experience our customer store anytime during normal business hours. Our customer store is ideally located in the Sacramento valley town of Galt, California, just off of highway 99, 30 miles south of Sacramento and only a short drive from many popular destinations throughout the region. 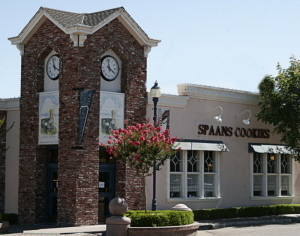 Our customer store is adjacent to our modern baking facility and expanded warehouse. The building is a historic property, built in the early 1900s, and offers the perfect compliment to the Spaans family tradition of offering quality, baked goods and old fashioned customer care for over 100 years. Baked goods are baked daily as we're always excited to share our products and family history with customers. While visiting, you'll find that our customer store has many items on display that were once used in our family's business over the years. Most notably, the 1922 delivery truck on exhibit in our customer store is a replica of our great grandfather's, Peter Spaans, service truck used to deliver fresh, baked goods to families along his expanding delivery route. Our customer store offers a wide selection of baked goods, some of which includes bread, parker house rolls, cinnamon rolls, fruit pies, cream pies, cheesecake, scones, muffins, brownies, turnovers and kuchen. Everything in our store is baked on the premises, using family recipes that date back to the early 1900's. While you are visiting please ask for a free sample! Depending on the day, a variety of items are available for sampling. We invite you to check out all of our gift items that have been carefully selected by our family. In addition to being able to find a unique gift for every occasion, we offer the areas largest selection of tea. With over 100 varieties of bulk loose tea and tea related items such as teapots, teacups, books on tea and tea sweetners, you are sure to find anything needed for your next tea party! Our retail store hours are Monday through Friday 9:30am-5:00pm, Saturday 9:30am-5:00pm.